Cali's mom (Cali is Hyacinth's sister) sent me an e-mail saying that she and her husband would like to make a donation in Hyacinth's memory to a charity of my choice. Some may not know already, my Hyacinth (Ch. Hydabrek’s Hyacinth Bucket) was recently killed by a Shar Pei while in some else's care. What wonderful words and thoughts; they touched me very much. I had taken all day to think about this and my heart-filled choice would be a Havanese Rescue. 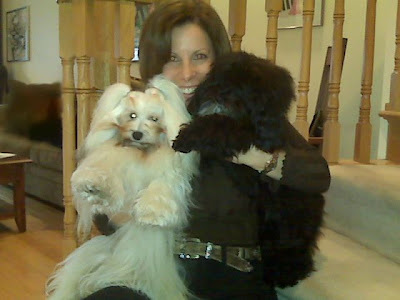 There are a few choices, not all of them are registered charities, but all have their hearts and hands in for the care of all Havanese. I think Hyacinth would like this too. P.S. : Both Hyacinth and her sister Cali are in this photo.